The saddest year of the decennia (lost of Chae Sun) was also the year that saw masterpieces born : Jean Yves Blondeau’s creations 2006. In Video the work with Danny Strasser near Andermatt produced maybe the best video of BUGGY ROLLIN ever : SWISSPASS. In this video, we speak about emotion, dreams, and respect against the beauty of mountains, and never forget to keep a child heart. A very few people could understand the messages. We also had a Wonderfull work with Christophe Lebedinsky in winter for BUGGY SKI and summer in the alps. After passing the big wave of Megapass, we had no more big promotion contracts. We made a few fun advertising, and some aesthetic videos like Igidae that did not catch success. This is the Rollerman Videos until 2005. The Germain times from 2000 to 2003 . Then arriving in korea and the TV shows made in korea. We still have a lot of video on tape format that has never been transferred to digital support. Thus before 2005 were camera very expensive. So we could not make as much video as we can nowadays. Video of BUGGY ROLLIN From the beginning until 2000. The firsts video were made with the “pink” suit. It has a very special aesthetic, that would match Tim burton fantasy. From 1998 came the second Prototype “Carbon”. It was opening a new world of performances. We tried to re load the videos that were bad quality to Vimeo in order to be bale to enjoy them with bigger screens. And now it is a real pleasure to see how good were already the motions. For example in the Lausanne video, there is a unfinished fast wheeling called Gognoc, that is not performed since a very long time. It is old but every thing was there. During the Germain years, the exploration of the possibilities to roll in bob tracks was very exciting. In TunnelBlick, a video co-produced by Danny Strasser and Jean Yves Blondeau, we make a travel trough the Germain sports facilities. We also went to Hot Heels, that event became legendary with the passing years. Chirstmas 2003 sbs finally come to visit jean yves blondeau in europe. They were showing to south korea what it buggy rollin for the first ime. It was a very successfull program. It was the beginning of a long love story between korea adn buggy rollin. That is how the korean odyssey began. We can easily see that the Korean took model on the “Extreme” video to make the KT Megapass film. This are the first Rollerman videos of 2018 . They are videos newly edited of old footage never shown yet. First Rollerman videos is Yanran test BUGGY ROLLIN in Altenberg 2011. This is one example of learning buggy rollin. Yaran is a cute chinese girl who has no idea of BUGGY ROLLIN. Jean Yves Blondeau teaches her the skills that enable her to roll alone in 45 min. and she enjoyed it. The Most beautiful secret and magic luge track in east europa. rolled down by JEAN YVES BLONDEAU ROLLERMAN with his BUGGY ROLLIN suit. The track is in a green velvet stage, it fly around one meter high in the air. It gives the sensation of flying in the forest. invited by Damian Andrey, Jean Yves Blondeau and his armor BUGGY ROLLIN rode the roads of the val de travers in Switzerland for a local TV. Another example of Teaching BUGGY ROLLIN by Jean Yves Blondeau as master of wheels and 3 students with very different skills age and level. The most important is to take the student at his level and help him to reach fun good sensations, in order to print good memory in the life. Rollerman, jean yves blondeau on national Russian television news. You will see it in Russian language of course ! This is just a small trailer of the full 126 movie. Maybe one of the most interesting video contend we ever made. This is a indictment for Peace and hope. Jean Yves Blondeau aka Rollerman show at bankbook . sound was lost . we had to check how to fit the music again so it is not perfect. performed with Blue suit. Jean Yves blondeau at his home in 2011. describing BUGY ROLLIN in french. Jean Yves Blondeau, Rollerman, races downhill the track of world championship 2010 in teolo Italy. This is a multiplex video produced and edited by jean yves blondeau, copyright jean Yves Blondeau. 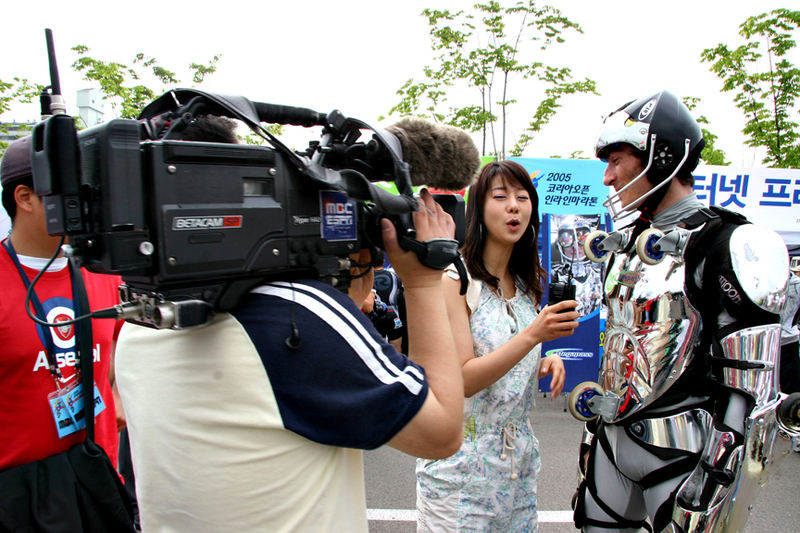 He uses a BUGGY ROLLIN wheel suit named Silver build in busan South Korea. This is an old video made in 2006 in Busan South Korea by Jean Yves Blondeau Rollerman with Silver suit and Danny Strasser on camera, produced by Kim Nam Hoon, with local chinese delivery restaurant as sponsor for meal and moped to go back up hill. “strong delivery man” is not a legend , and a touch of the lost beloved Chae Sun for Elmo car. Another successful teaching BUGGY ROLLIN to absolute beginner with good mood. On the side of shooting “In Puncto”, the sweet Nicole, tried BUGGY ROLLIN wheel suit with Jean Yves Blondeau As teacher . Baden Baden 2009. Last video of renew old serial is you will never guess that it is so good ! A short reedition of one of the best moment at Peyragudes in France in 2010 Jean Yves Blondeau AKA Rollerman rides the Silver suit from South Korea in real speed. From Christmas 2006 to april 2007 we had golden time to BUGGY SKI every day at MUJU RESORT. 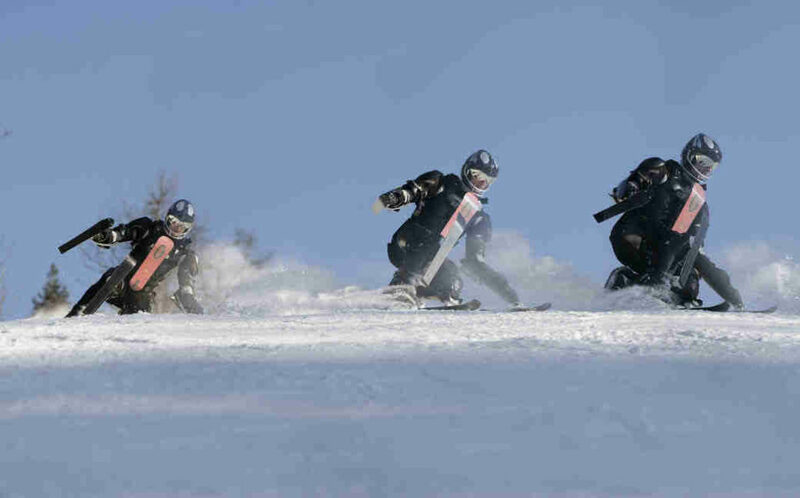 This is BUGGY SKI in South Korea 2007. With the complicity of Yvon Labarthe we could make almost 30 promotional videos for the resort. We were filming almost every day. Most of video were with BUGGY SKI, and some were only for the promotion of the ski resort such “MUJU WHITE”. The hours of video material were sleeping during 10 years on a hard disk. When Jean Yves could finally put his eyes on the films, It is a great pleasure to see all that night rides. The sensation of skiing in the night, with the music played on the tracks every where, is very unique. The music is carrying the choreography of motions, and the mood stays in happy dancing level. Another magic in night skiing is that the snow keep good quality and even gets colder and faster as the night progresses. Jean Yves Blondeau was making show with BUGGY SKI every evening from 8 to 10 pm in the week and from 8 to midnight the week end. During the day he had just enough time to upgrade the prototype and make test in the evening. First Jean Yves Blondeau the Rollerman explains the videos of 2016 serial of Xichang. All videos are made from his back point of view. It is performed in the old city that has narrow street and sloppy profile. As the night fall, it becomes a firework of light. The second gallery is about Freezy coming in france to get training with Jean Yves Blondeau the Master of BUGGY ROLLIN. You can also discover some freerides with friends and Training of Herve and Ksenjia. The third video gallery will make us travel in china. We will see the first steps of freezy in shanghai, the runs in the desert around Zhongning, and some choreographed show of Jean Yves Blondeau. For the end we will visit the Jackie Chan Stunt team Training Center , where he prepare all his new movies. First serial of BUGGY ROLLIN videos 2017 of Jean Yves blondeau Rollerman, are Urumqi in china. We are going to meet Xiao Long and Chang Yue. And we are going to visit Sochi. Every day on the Bob track, breaking BUGGY ROLLIN track speed record, going on 17% creasy steep road finishing in freeride paradise. Take time to scroll the list down. 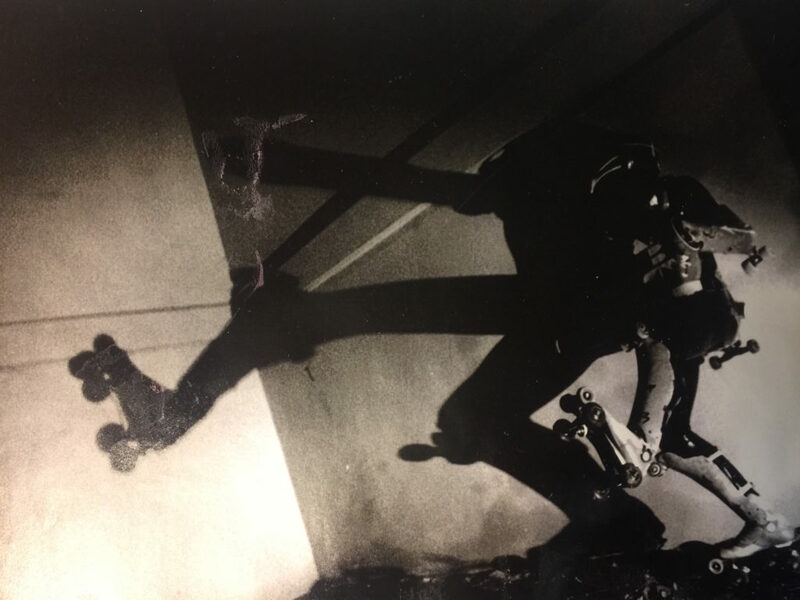 Jean Yves Blondeau was invited by Beijing Micro Skate company to make show in schools with BUGGY ROLLN at Urumqi in order to promote Roller Sports. As introduction meeting before the event, the sport government People explained us some special rules applied to this area. Police can control camera or phone picture at anytime. We are not allowed to take picture of police, security, government buildings or government people. If police ask to control we must cooperate without trouble. That is no problem because police is not our interest. We came for sport and education. The luggages were scan at each hotel. They were scan at parcs gate and restaurants. We just passed patiently all control. We were warmly welcomed in schools. Schools presentation was made very seriously, kid would sing songs altogether perfectly. Some Kids were natural genius in how they integrated the need of learning foreign language in order to straight communicate. Second video gallery is a serial with Riderman in french Alps mountain roads. Charix plagne, and the serial of La Toussuire with Fragl. Third gallery going to bring us in china for the most beautiful 6 days freeride ever made with Atomic Krew shanghai through the BaiMaShan Mountains. Fourth video gallery shows crazy girls on wheels and Nanjing Rollergames olympics downhill runs with one special group run. It is very special. After 3 year of attempt to get russian visa in time to be a part of the competition, Jean Yves Blondeau could go to try the Sochi olympic bob track with his BUGGY ROLLIN suit. Rollerman at Sochi Bob Track race was fast. Indeed Rollerman could set up his speed recored to 100Km/h600 on Bob track . RollerMan @ Sochi DAY 4 WTFFF ROAD RUN is maybe one of the most spectacular video of rollerman on competition road.